I wish I could tell you that I did something completely productive on my first night in New Zealand, after my scenic showdown with the stewardesses, but as soon as I signed into my hostel in Auckland, the reception staff signed me up for a bar crawl going around the nightlife of New Zealand’s biggest city. But not to fear, I woke up early the next morning with a spring in my step. Why? I’m in New Zealand! Possibly the country I was most looking forward to visit. And I couldn’t wait to see all the beautiful scenery so highlighted in detail throughout my Lord of the Rings Marathons! But first, I needed to get myself sorted out. I did my food shopping, got myself an NZ mobile sim Card, booked my next few nights accommodation and transport. It was all pretty much easy. 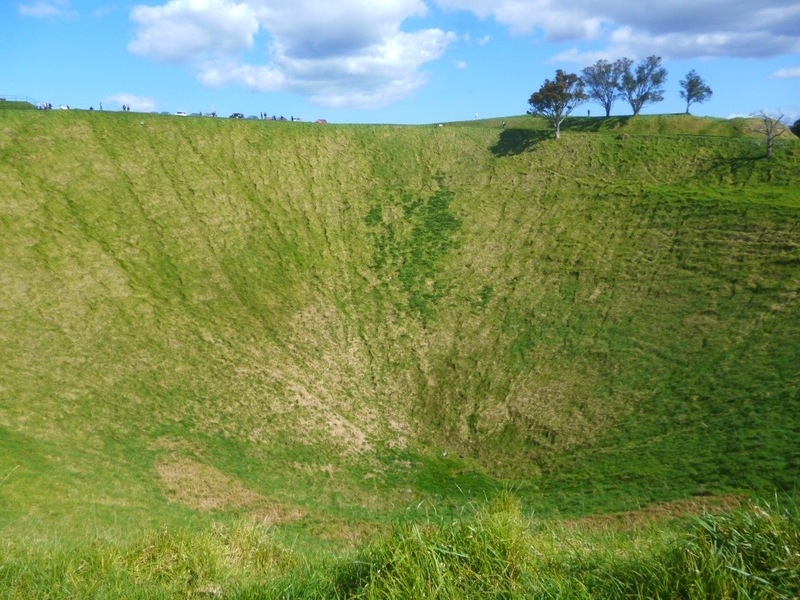 Then I thought I would kick off sightseeing New Zealand with a bang. But in this case, I hope it doesnt go bang because I’ll be done for. Ladies and Gentlemen, I will be climbing a Volcano! Catching the public bus from the main bus terminal to Mount Eden Park, I jumped off and looked up at the splendour of Maungawhau or better known as Mount Eden. The highest cone in the Auckland region at 196m, you’d be quite surprised how many cones jut out of the ground around. 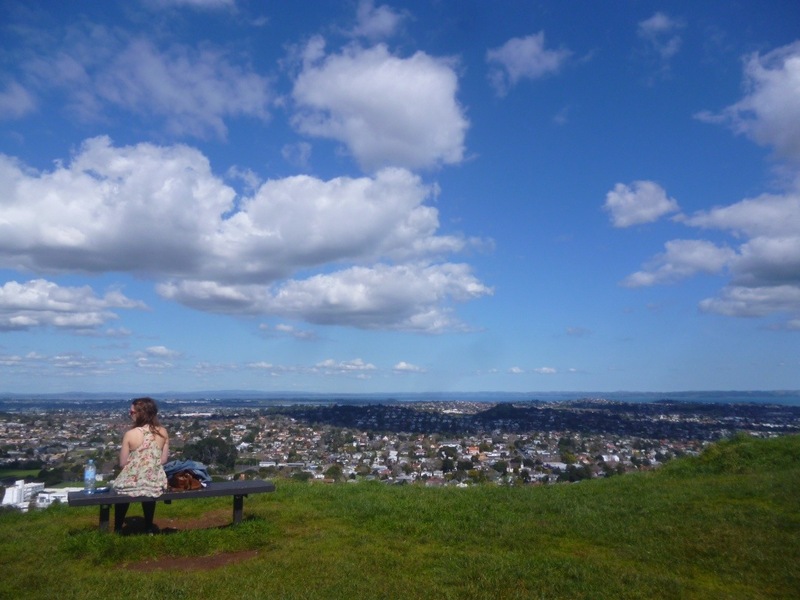 Auckland is sitting on the centre of seismic and volcanic activity! This cone is readily accessible and has its own car park close to the top but if you are a seasoned walker like me, I think the best way is to walk from the bottom. 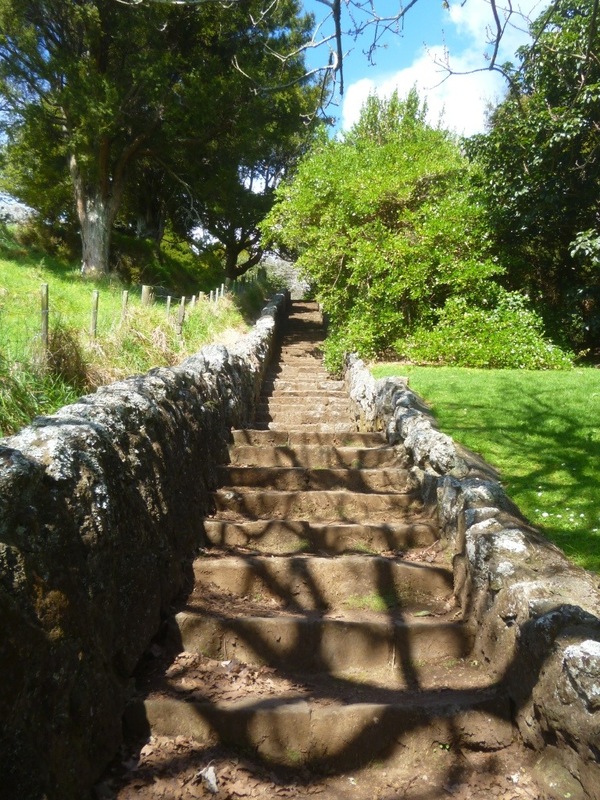 Walking up, you can see many of the old pa terraces and storage pits used back in the day by Maori people, the indigenous people of New Zealand. 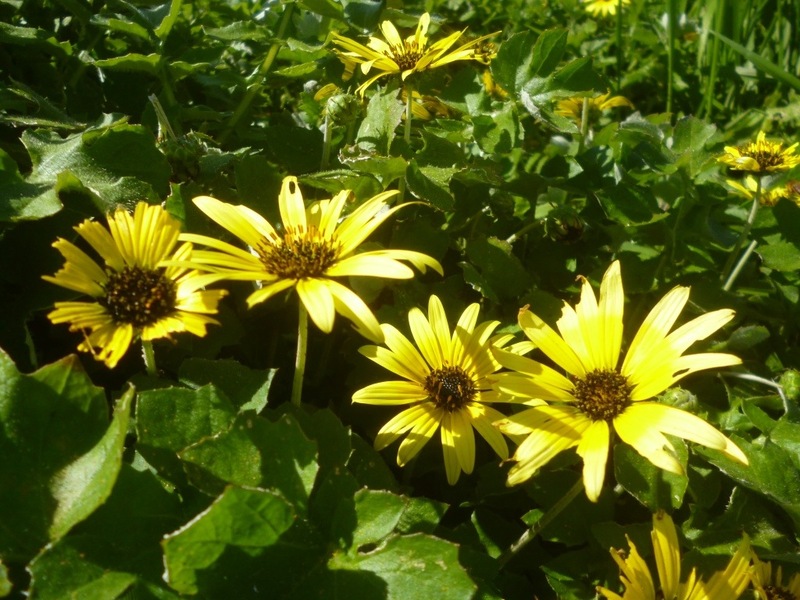 There’s fantastic flora as well to behold on this sunny day. It takes about 40 mins to reach to the top and that’s when you see the cone inside..the symmetrical crater called Te Ipu Kai a Mataaho (the food bowl of Mataaho, the god of things hidden underground). Unfortunately, it’s not spewing out lava to hit me in the face and being very very angry, but rather very calm and peaceful. So peaceful that it’s gone to sleep and allowed the crater to be filled in with soil. There’s a big no no when you are up here. 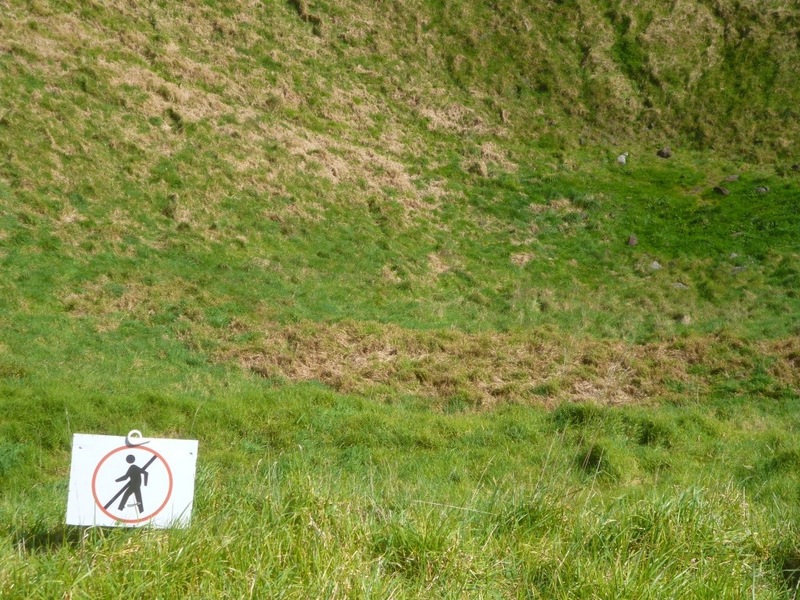 You’re not allowed to go whee down into the crater. Despite my visions of crashing through the soil and falling into the lava chamber below, it’s actually a big cultural no no that stops people from running down the cone giggling. It’s tapu. (sacred) and it will be a huge affront to the Maori of you do so. 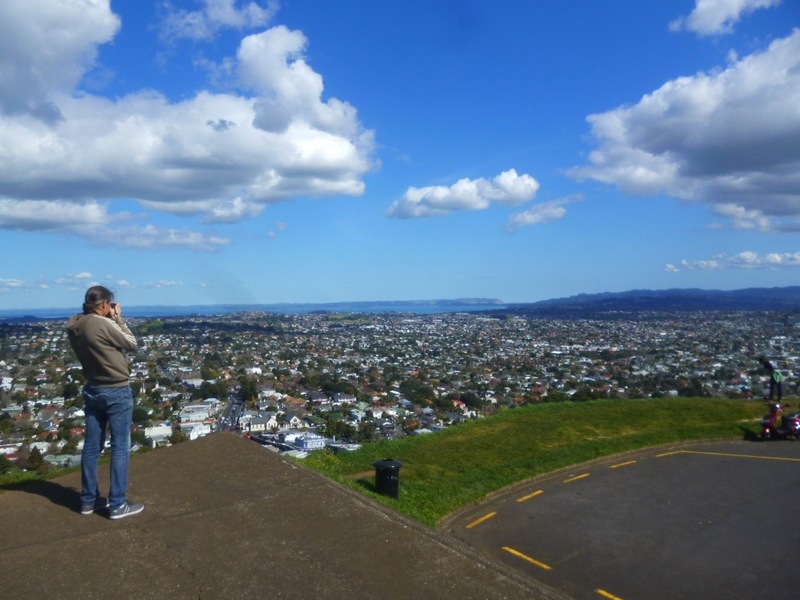 Finally I reached one lip of the crater and stared north to the Auckland city skyline and also the many islands that’s dotted majestically in the sea. It was pretty panaramic and I sat down for a long time taking it all in. 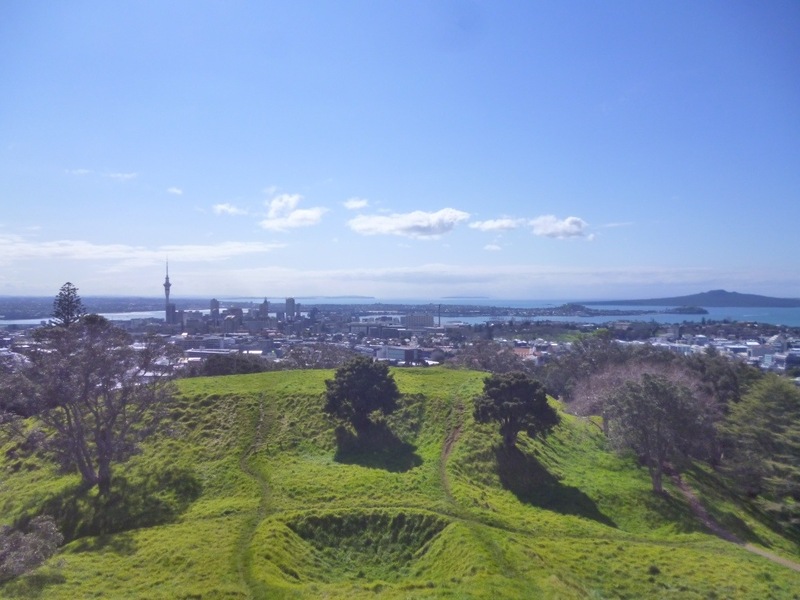 You can see the Auckland Sky Tower in the distance…the one that looks like a huge hypodermic needle. 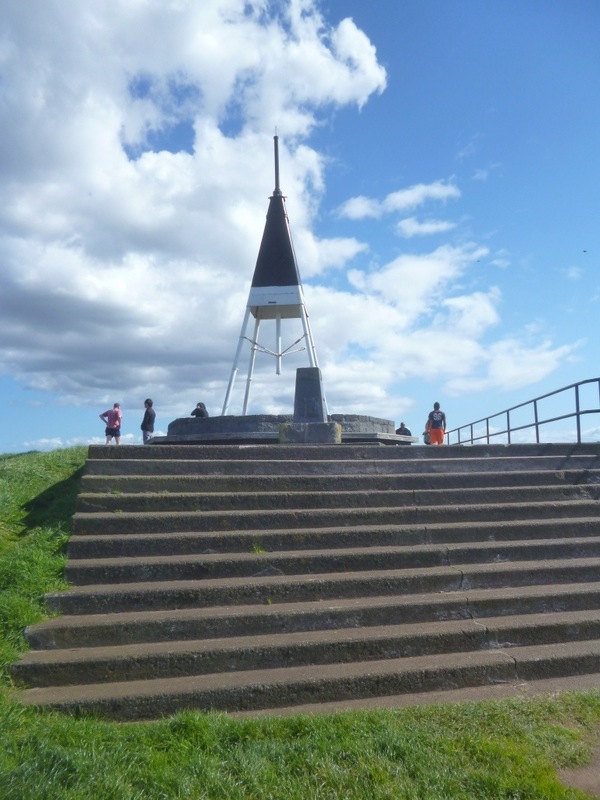 Right at the highest summit, there’s a structure built in commemoration of the Auckland Geological Society. I’m sure it meant to be symbolic but it’s a great place to sit down when you need one! 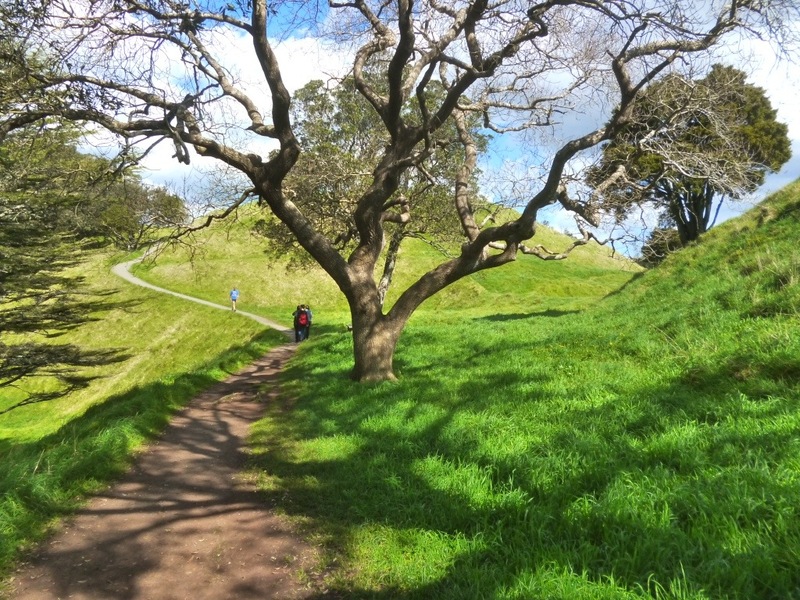 Soon, the wind became cold and I zipped up my jacket to my chin, red-faced from the cold and also from the sun as I squinted out in the glare to look at the hilly surrounding of the Auckland region. It was a great start, I thought, to the fantastic country I’m expecting ahead. Bring on the Auckland City!